Since 2003, a certain gentleman has been posting articles for Mises Daily, a daily commentary for the Ludwig von Mises Institute that reaches about 40,000 people daily according to LMI's "About" page. 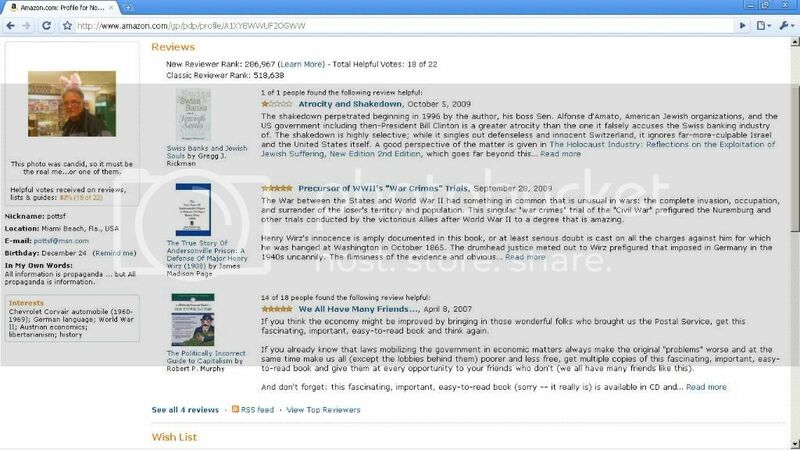 Here is the list of his Mises Daily articles [screenshot]. The Daily and its subscribers are clearly unaware that he has begun a parallel Internet career as a Holocaust denier. ...despite the Juggernaut’s rude health and limitless capacity for expansion, a cancer is metastasizing aboard it that will one day break its axles, shatter its cross-beams, and bring it to a sudden, catastrophic halt in the center of a mob that has suddenly realized that they have been its dupes for many years and have heaped onto it far too great a portion of what would today remain their own treasure but for the inertial deception practiced upon them by the Juggernaut and its now-dismounted riders. And when the breakdown finally occurs, and the free riders are spilled out onto the road among their erstwhile worshippers, those feeling vengeful urges against any of them will have the comfort of the enormous odds that any given one of them never paid in any way for their high and mighty ride aboard the Juggernaut of Conscience. Who is the author of this fact-free screed, with its offensive stereotypes of masses of free-riding Jews? Just as the fumigation of clothing with cyanide gas to alleviate typhus epidemics gave rise to accusations of homicidal gassing at Auschwitz, the inoculation of prisoners at Andersonville against smallpox produced charges that the notional vaccine was doped to kill its recipients. Just as prosecutions aimed at implication of Hitler in ordering extermination of concentration-camp populations, Wirz was secretly offered clemency if he would but implicate Jefferson Davis, the president of the Confederacy, in an alleged program to murder Union prisoners of war. “Zyklon B” is in fact the trade name of the fumigant made for such purposes in Germany since long before the Second World War, when it was occasionally imported for use in the United States among other countries. Despite the unsuitability of a fumigant for purposes of killing people, Höss’s memoirs report its extensive use for that purpose. It is possible that Höss, aware of the prevalence and popularity of the rumor among his captors, undertook to support the story in his memoirs even if only to gain a short reprieve from his looming death sentence. It is also possible that these portions of his memoirs were written or dictated by someone else; Höss was undeniably totally at the mercy of determined and vengeful captors. In any event, Höss was executed for the use of a product that had been introduced into the camp, at least initially, to alleviate death and suffering among the inmates. He has also posted extensively on Amazon's Holocaust denial talk page. He states there [screenshot] that the real Holocaust death toll is 1,723,433. 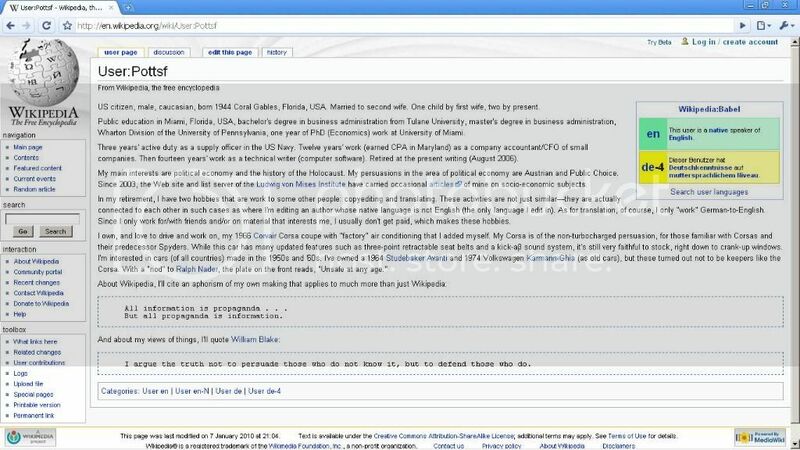 He also regularly edits Wikipedia pages on such luminaries as David McCalden and David Irving, and also made a failed attempt to have David Cole's Wikipedia page reinstated. It seems that he is just another person of Germanic descent whose inability to accept the result of World War II has led him to embrace denial. The fact that he waited until he reached the age of 65 until 'going public' with these beliefs does not make them any less reprehensible. We are sure that Mises Daily and its readers will reach the same conclusion. We have no desire to restrict his right to post his HD views and thinly veiled ad hominem attacks upon Jews (which look forward to future 'vengeful urges' being expressed against them) at CODOH and elsewhere, but we believe that the Mises Daily subscribers are entitled to make informed choices about which authors they receive in their email in-boxes. It is a crying shame that someone like that is writing for a paper bearing Ludwig von Mises' name. Mises was an enemy of the Nazi's and had to leave his native land after Anchluss. It is a dishonor to the great economist's memory that a Holocaust denier writes for the Mises Institute. I read through his reviews and posts and I don't see any ad-homs against jews or holocaust denial. You must be blind then. Care to address the evidence? You are the one making the ad hominem attacks. Please list Potts' ad-homs because I don't see them. Excuse me but you still failed to tackle the evidence. > You are the one making the ad hominem attacks. Neither I nor Jon make any ad hominem attacks. We're not saying "Potts is wrong on points A, B and C in his Mises articles because he is a denier". We're simply pointing out that he is a denier. > Please list Potts' ad-homs because I don't see them. Quotes from Potts are given in the article. > Questioning the death toll numbers does not a denier make. Ridiculously diminishing the death toll despite the evidence to the contrary does a denier make, but that is not the only argument Jon cited, so you're erecting a straw-man to punch it down. > 'free riders', i.e. people that non-deniers regard as Holocaust survivors. He doesn't refer to survivors of the Holocaust as 'free-riders'. this is a straw man of his editorial. "Ridiculously diminishing the death toll despite the evidence to the contrary does a denier make, but that is not the only argument Jon cited, so you're erecting a straw-man to punch it down." He does not deny the Holocaust so using the label as a denier is disingenuous. He claims that 1,723,433 million died and not 6 million as is often portrayed in the media. The Holocaust has been so marred by the Propaganda vs Revisionism War that I have no interest in finding the truth. Just keep the Mises Institute out of your battles. BTW Mises.org was founded in honor of Ludwig von Mises, a Jew that emigrated from Europe to America during WWII so it would be an odd home for a Holocaust denier. 1. Potts writes for the Holocaust denial publication. 2. He significantly minimizes the Holocaust death toll as all deniers do. 3. He denies Auschwitz gas chambers. 4. He repeats Holocaust deniers' claim that all or parts of Hoess' memoir might were fabricated, or else Hoess wrote only what his captors wanted (even though the content of the memoir is not compatible with this claim). 5. He is at least sympathetic to David Irving, judging by the nature of his wiki edits and by at least one article in Mises Daily. 6. 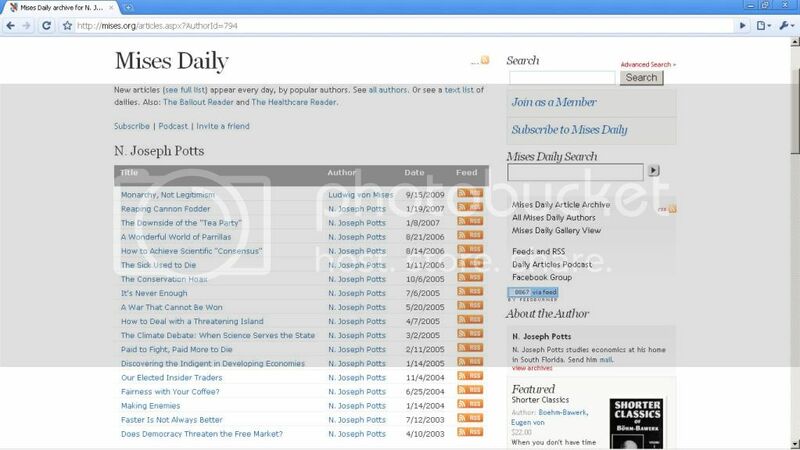 Potts argued for denial extensively at Amazon's pages. 7. He wrote there: "Did he [Hitler] exterminate the Jews of Germany and Central Europe? No, not that many of them." 8. There he promoted Holocaust denial video "One Third of the Holocaust" (thouroughly debunked at this blog). 9. There he wrote at length of "Holocaust mythology", especially in the context of war crimes trials, and not laymen's perceptions. He also wrote: "but then I will run into another perpetuator incantation, that of "the Holocaust is unique," which I keep in the same container as that in which I keep "antisemitism is irrational" and "they hate us for our freedom. "; while he is free not to take the uniqueness of the Holocaust seriously, apparently he thinks that the claim that "antisemitism is irrational" is false. And yet Jonnie still denies that Potts is a Holocaust denier or that there is any denial involved. Who is Jonnie? A person blinded by fanaticism? A fellow denier (note how he is nonplussed by the ridiculous minimization of the death toll)? Just a troll? Jonnie adds: "Just keep the Mises Institute out of your battles". But it's LMI that published the Holocaust denier Potts, though of course they did this unknowingly. Straw man. He said 2 million JEWS were exterminated by the Nazis. I'm sure there were more non-Jews that died and of even crueler deaths in the concentration camps. I think it's a tragedy that the public never gets to hear these stories. "But it's LMI that published the Holocaust denier Potts, though of course they did this unknowingly." So? He doesn't talk about it in his daily articles. I am sympathetic to all non-violent victims of the State. David Irving being one of them. I'm beginning to think there's an ulterior motive to you trying to associate the LvMI with Holocaust denialism. > Straw man. He said 2 million JEWS were exterminated by the Nazis. You don't seem to understand that minimization on such a scale is a part of the definition of the Holocaust denial. Along with denial of gas chambers. Sorry, but you're clueless about the topic. > So? He doesn't talk about it in his daily articles. > I'm beginning to think there's an ulterior motive to you trying to associate the LvMI with Holocaust denialism. Of course you do, being an irrational being that you are, denying the obvious Holocaust denial of Potts. "I'm sure there were more non-Jews that died and of even crueler deaths in the concentration camps. I think it's a tragedy that the public never gets to hear these stories." Buffoon. Many of the crimes discussed at the International Military Tribunal and in subsequent trials were against non-Jews. You've blown your cover. Now go away. "Of course you do, being an irrational being that you are, denying the obvious Holocaust denial of Potts." "Holocaust denial" sounds like some Orwellian doublespeak. Why can't you call him a negationist? "Buffoon. Many of the crimes discussed at the International Military Tribunal and in subsequent trials were against non-Jews." I bet you the PUBLIC doesn't know there were more non-Jews killed in the death camps than Jews. > "Holocaust denial" sounds like some Orwellian doublespeak. > Why can't you call him a negationist? So there. If you think we wouldn't have exposed NYT columnist in the same way, you're mistaken. > I bet you the PUBLIC doesn't know there were more non-Jews killed in the death camps than Jews. Except extermination camps were specifically for Jews, so more non-Jews couldn't have been killed there in principle. More non-Jews died _during the war_, not as a part of the Nazi State extermination plan, but as a part of war, general poor conditions, hunger, bombings etc. 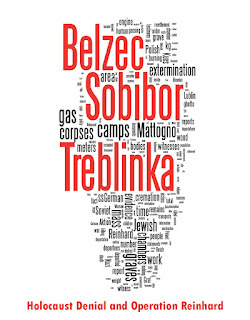 Camps like Treblinka, on the other hand, were created specifically to "solve the Jewish question". 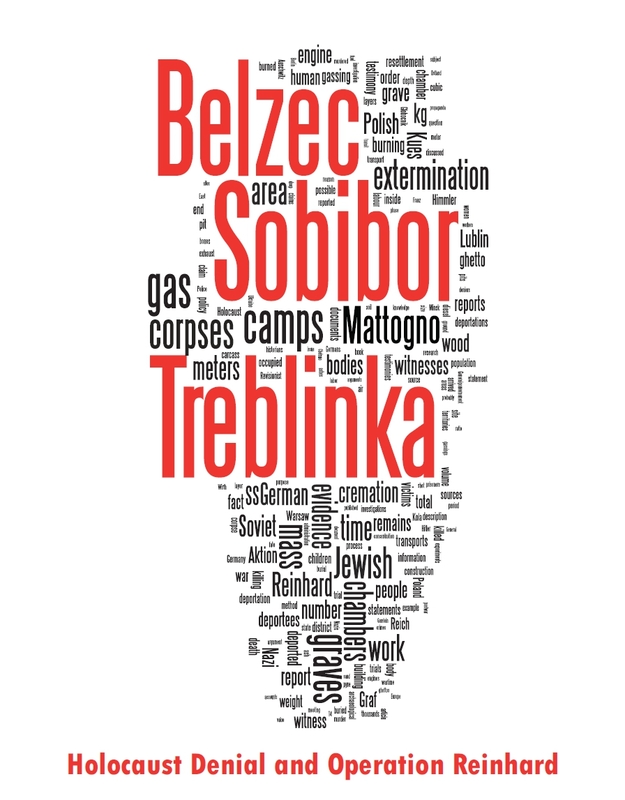 In Treblinka about 780,000 Jews were killed - and about 1000 Gypsies. In Auschwitz about 1,000,000 people died, about 900,000 of them Jews, etc., etc. So it's you who are ignorant of history. "Evans argued that the term is generally understood to denote "the attempt by Nazi Germany, led by Hitler, to exterminate the Jewish population in Europe, which attempt succeeded to the extent of murdering between 5 and 6 million Jews in a variety of ways, including mass gassings in camps built for the purpose". It follows that a "Holocaust denier" is someone who, for one reason or another or for a combination of reasons, repudiates the notion that the above definition of the Holocaust is apt to describe what was sought to be done to the European Jews by the Nazis during World War 2." 1. Denial of systematic genocidal plan of extermination? Check. In his essay in Holocaust-denying "Smith's Report" Potts defines the Holocaust as mere ethnic cleansing. This is a direct denial that the Holocaust was a genocide, i.e. mass murder with intent to exterminate or diminish an ethnic/racial/religious/national group. While any genocide is ethnic cleansing, not every ethnic cleansing is genocide (e.g. forced removal). And yes, he does include some murders in his description of what _he_ calls the Holocaust, in the last place, after hunger, general privations, etc. This means that although he believes that some Jews were deliberately killed, it was not a part of the systematic state extermination plan, maybe by rogue Nazis, etc. 2. He certainly denies 5 to 6 million statistic supported by current scholarship. (Older scholarship, currently inadequate, e.g. by Reitlinger, allowed for lower threshold of about 4 million; it's a murky case, since obviously you can't specify the "cut-off" number before which one is a denier and after which one is not; cf. the Sorites paradox). 3. Finally, he denies at least Auschwitz gas chambers, and judging by his comments, he doesn't accept the gas chambers in Aktion Reinhardt camps either. So, I'm afriad, Potts meets all the Irving v. Lipstadt criteria to a tee. I've always like what Potts has written in the areas of his specialization in the past (global warming and war mostly). However, we are not in the business of mind control and people can wander into unpredictable areas. I think, for example, of one of the writers we publish named Gene Callahan, once a great libertarian and free-market theorist who seems to have repudiated libertarianism (as far as I can tell). What are we supposed to do about that? I'm not going to purge his prior contributions, which are wonderful, or otherwise call for him to be burned at the stake. The only thing we can do is not publish Gene's anti-liberty material. I suppose it is the same with Potts. I have no interest in publishing his speculative writings on history, but neither should Mises.org be held responsible for the far-flung interests of every one of our many hundreds of our past writers. Jeffrey, thank you for your reply. I am not suggesting that you should purge Potts' previous articles. My argument is that your subscribers should be fully informed if a Holocaust denier and probable antisemite is writing for the Daily. I believe that some (though clearly not all) of the subscribers would be horrified by the views that Potts has expressed concerning Holocaust survivors and their relatives. 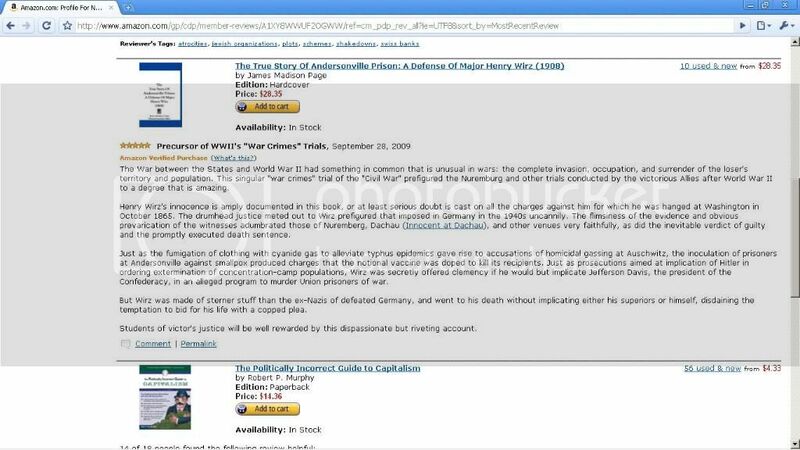 I'm sure you are aware of von Mises' own biography and why it may not be appropriate for a Holocaust denier and probable antisemite to building a profile on the back of von Mises' legacy. Are you confident that continuing to publish Potts would not result in a reduction in your subscriber base? Jonathan, I said nothing about continuing to publish him. Please read more carefully. And if you know anything in depth about Mises's views on these topics, it is because of articles and books the Mises Institute itself has published and financially backed, among which is Mises's own Omnipotent Government and his own account of his forced exile from Austria and sanctuary in Geneva - as found in his Memoirs. Both books are published online and in physical form. Yes, I have read von Mises' own archive on the site, including his 1944 piece, The Socialist Calumny Against the Jews, which discusses atrocities against Jews in the East. A valuable source. Many thanks for publishing it and for giving us your answer to our concerns, Jeffrey. Nice, Harrison. "Probable antisemite," eh? You should probably tell his wife and children that, considering they're all Jews. I can't say I'm surprised that a website like this would catch wind of a revisionist like Potts, but I am surprised that Mises.org would censor him. As the son of Joe Potts, a member of Mises.org, and a Jew, I think it's unfortunate Tucker would have Potts banned from Mises.org because some people (probably donors to the institute) don't like his writing. He is trying to write about a topic that is very controversial but only permitted (as evidenced by Tucker) to be viewed one way. Ludwig must be turning in his grave. 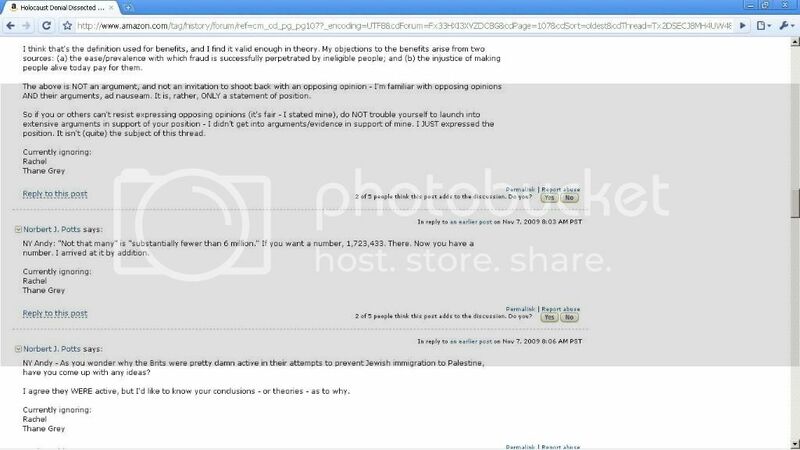 Why did the donors decide that Potts' Holocaust Denial was too offensive for them to continue publishing him? Do you think those donors were trying to protect the 'hoax', or do you think that maybe, just maybe, they thought he was insulting people whose relatives were murdered? Oh please. This excuse - "his wife and children ... they're all Jews" - if true is right there between "but but but my best friends are Jewish" and "but but but I'm Jewish, how can I be antisemitic". Yes, there are antisemitic Jews and there are antisemites whose best friends are Jewish. Amiri Baraka had a Jewish wife and two Jewish children, which did not stop him from writing "poems" like "Smile, jew. Dance, jew. Tell me you love me, jew. I got something for you, like you dig, I got. I got this thing, goes pulsating through black everything universal meaning. I got the extermination blues, jewboys. I got the hitler syndrome figured." Which is not to say that Potts is (or is not) an antisemite. It's just your argument is crappy. I'm opposed to censorship on principle. If anyone finds Smith's views to be unduly biased, historically inaccurate or badly interpreted - then the challenge to debate and argue it out should be extended. Anything less would intellectual insecurity or moral cowardice. Otherwise, it remains to draw him out on this, so that the he may fairly and reasonably defend his views.